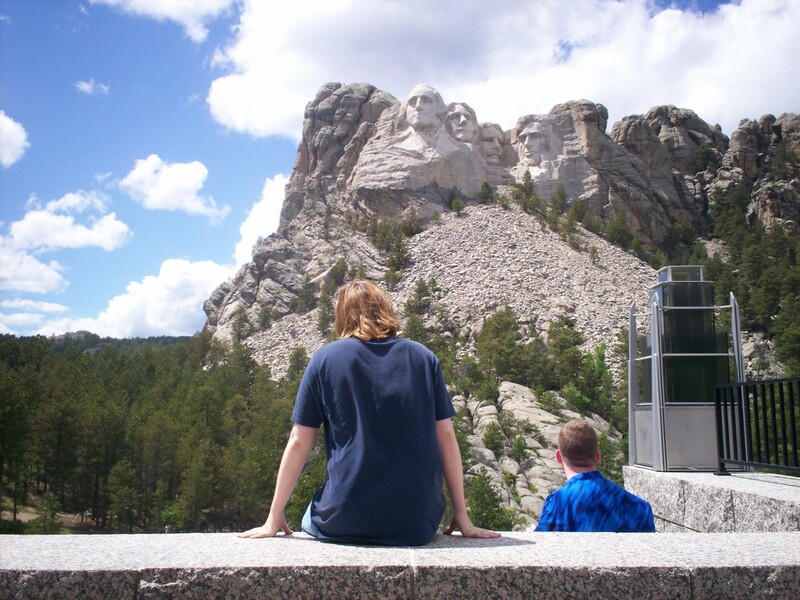 Our 2009 Road Trip, Part 14: Rushmore! « Midlife Crisis Crossover! 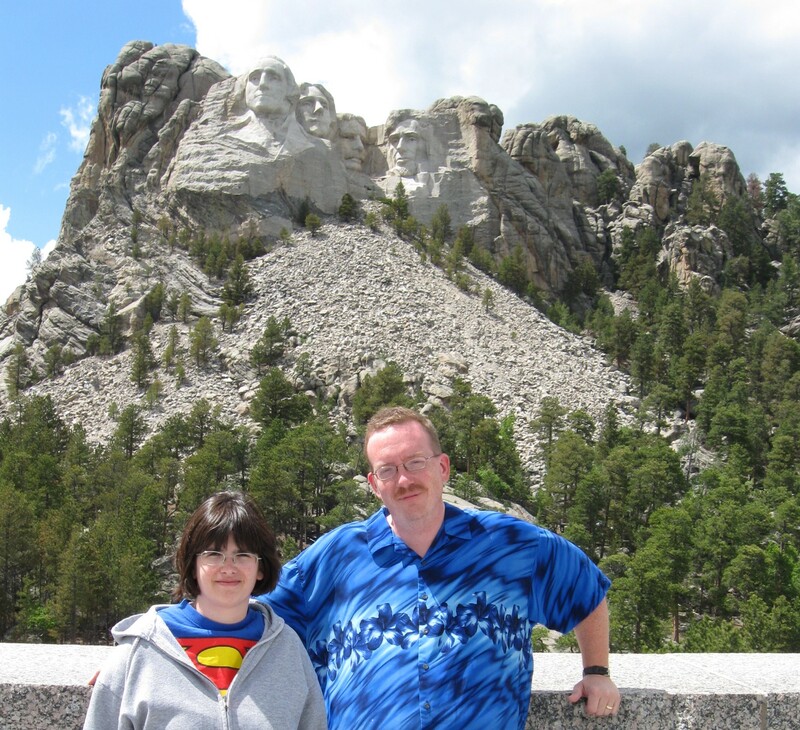 Our 2009 Road Trip, Part 14: Rushmore! Photo by my son, nailing the “homemade Christmas card” aesthetic. George Washington. Thomas Jefferson. Ted “Theodore” Roosevelt. Abraham Lincoln. You might remember them from such films as North by Northwest, Superman II, and National Treasure: Book of Secrets. It’s okay if you don’t remember that last one, but it’s not the last time we’ll mention it in this miniseries. 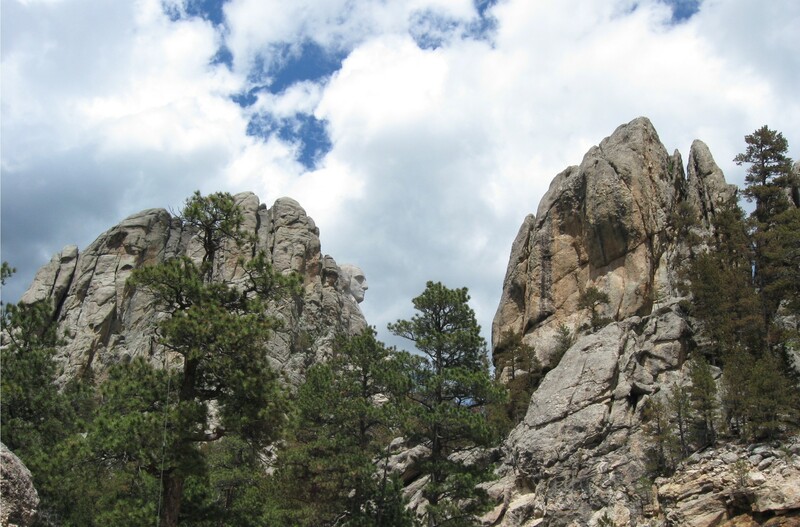 Once again we rove those beautiful Black Hills. Now with safety railings. From the Crazy Horse Memorial we had to drive north, then east, then south of Crazy Horse, then east again, most of this on steep mountain byways with few barriers between us and a lengthy plunge to fiery death and fleeting fame. 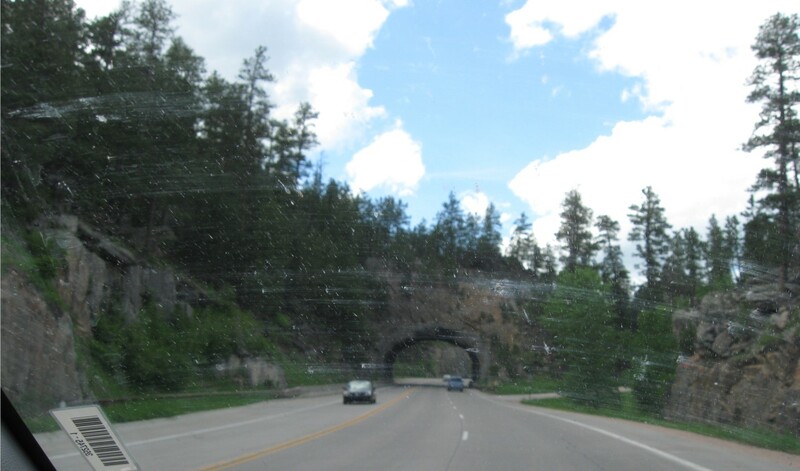 Passing hillside features such as tunnels and bridges while our windshield keeps adding to its dead bug collection. That gauntlet led to our next stop, the day’s feature presentation. We laid eyes on its southwest edge and screeched to a roadside halt for some choice staring. Teaser image for the next several images. At long last, we’d arrived at Mount Rushmore, the centerpiece of our vacation. Admission is free, but they charge a fee for parking. 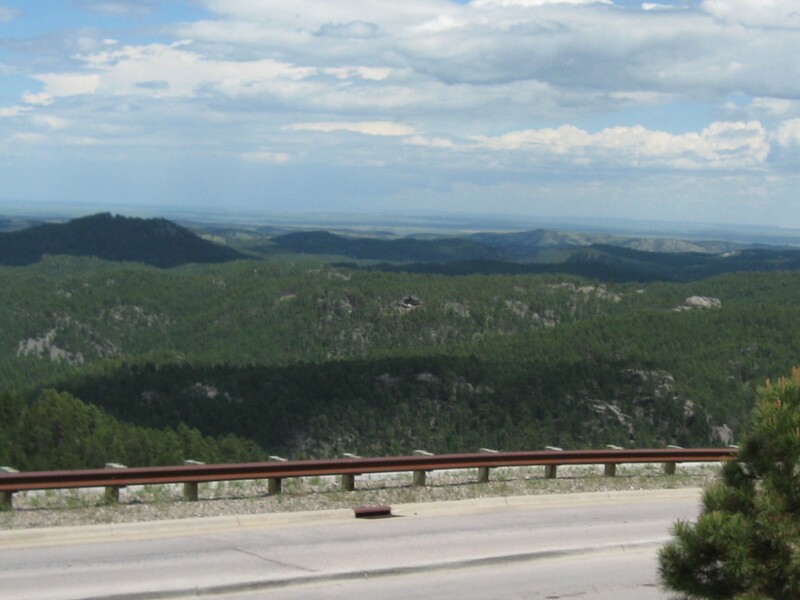 Wiser travelers can save money either by hiking dozens of miles from Rapid City, bicycling up the steep hills and their narrow roads, or maybe hang-gliding. 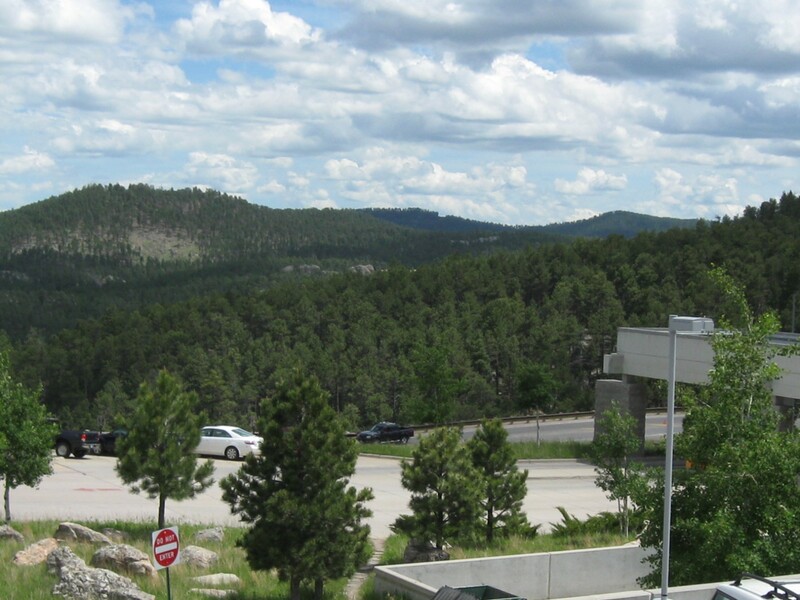 In exchange for your parking fee, you’re treated to yet another view of those gorgeous Black Hills. …or you can turn around and face the faces, also visible from the lot. 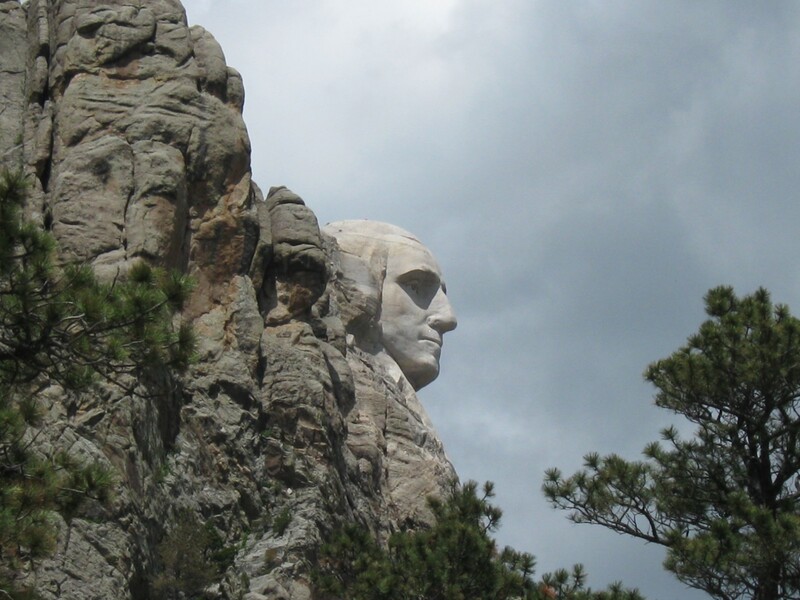 The official stats: Rushmore was sculpted from 1927 to 1941 under the supervision of artist Gutzon Borglum. 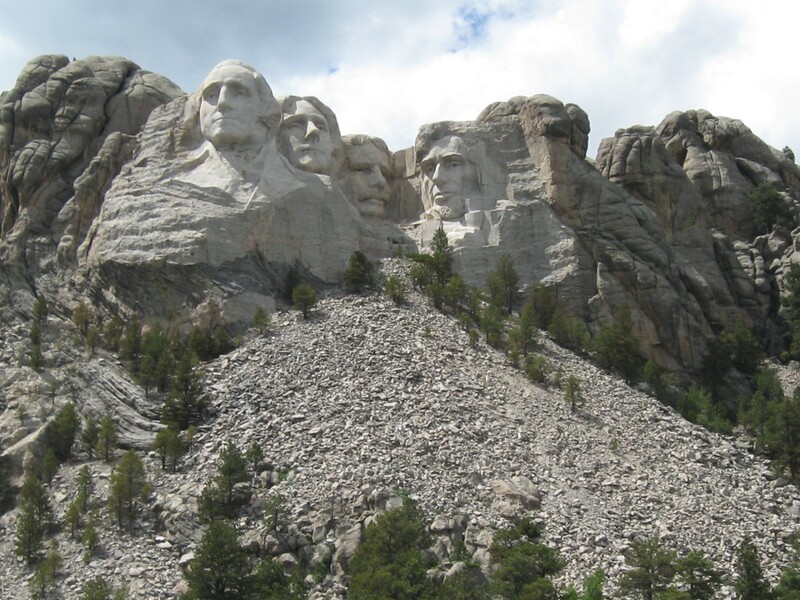 The heads of four fabled Presidents of the United States of America stand sixty feet tall and are composed of mostly granite. They’ve been added to, parodied, and destroyed numerous times throughout pop culture, but the real deal remains unblemished. It helps that they replaced the original sealant a while back and added modern hardware to monitor for geological issues. In the main area, as close as permissible, we snapped our mandatory basic Mount Rushmore photo, per American vacation laws. I had never noticed the gravel pit cascading beneath it in photos or videos until we came to South Dakota in person. Now it’s the first thing I notice, every time. I also noticed we needed to stay mindful of our surroundings, as there was nothing to prevent wildlife from trying join our party. 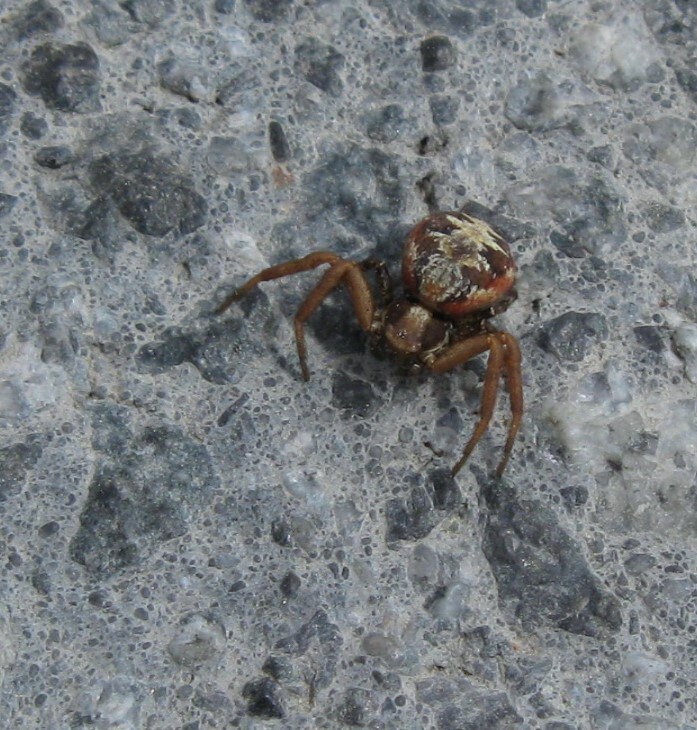 My best guess is a triangulate cobweb spider. Not that pinning down the exact species would make it lovable. 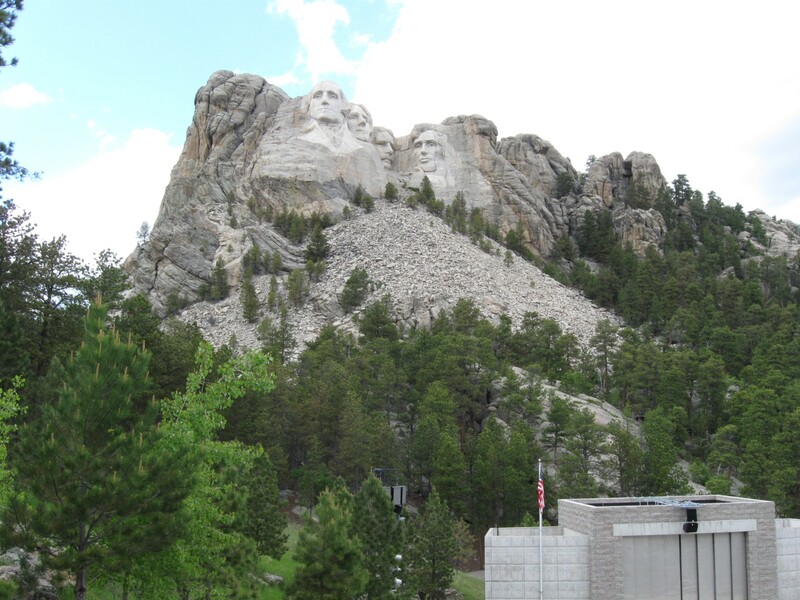 The official name for the grounds are the Mount Rushmore National Memorial. Its promotional literature utters the magic words that make any monument a winner: “The Visitor Center is free.” The exhibits show actual archival footage, testimony, tools, and near-death anecdotes about the arduous processes of planning, carving, sculpting, dynamiting, funding, marketing, and renovating America’s most beloved four-headed patriotic sensation. Also on display are examples of Rushmore in pop culture — that North by Northwest climax running on a loop, MAD Magazine covers, comic strip cameos, crap souvenirs from decades past, and so on. Most important of all, the Visitor Center answered a question every American has had since childhood: why those four Presidents? 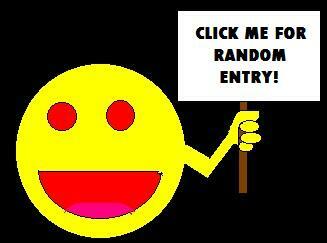 Why not John Adams or FDR or General Grant or the short one or the unmarried one or the fat one? 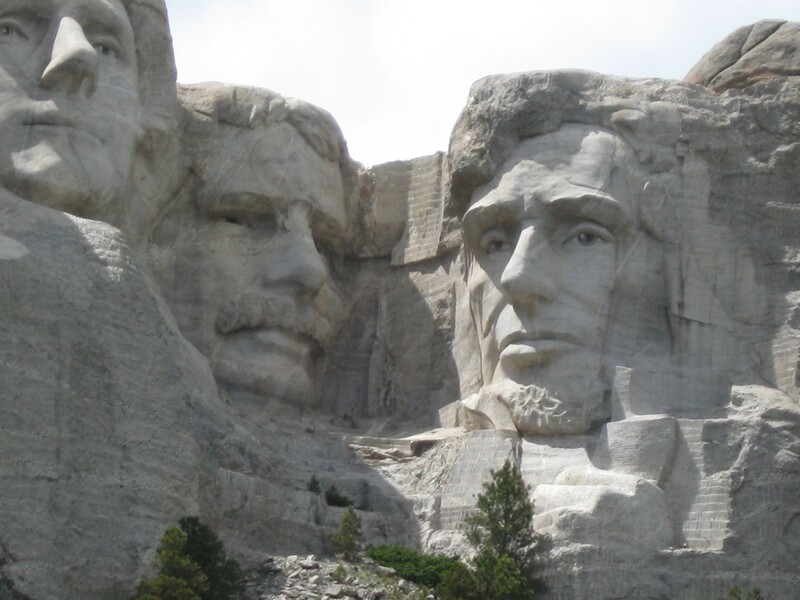 The long-awaited answer: the Presidents chosen were to represent the country’s birth (Washington), growth (Jefferson), preservation (Lincoln), and expansion (Theodore Roosevelt). Make of that symbolic significance what you will, here on these acres that were seized from the Lakota tribe circa 1876. 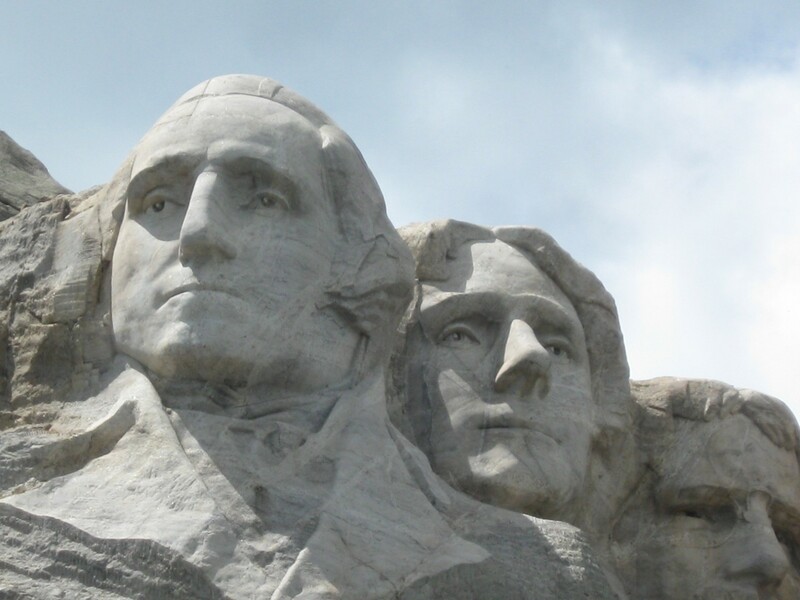 Washington and Jefferson, once allies in the American Revolution, if not quite best friends. Roosevelt was 6 years old when Lincoln was assassinated. If they’d ever met as adults, I firmly believe Teddy could’ve taken Abe in a fight. We spent more time in the Rushmore gift shop than in any other gift shop that week, then returned to the treacherous mountainside terrain that would take us back to Rapid City and to one more attraction before nightfall, if we didn’t pitch over the guardrail like a fleeing Mannix suspect first. Photo by Anne, always on the lookout for those elusive father/son photo ops.